Home / finance / pinoy in korea / Work in Korea / What You Should Know About Your Korean Won Remittances? What You Should Know About Your Korean Won Remittances? One of the main concerns of any overseas worker in any part of the world is the remittance. An overseas worker must know how to send money to their family from wherever part of the world especially for Filipinos in Korea. And by knowing “how to send money from Korea” I mean finding out options to maximize the value of your won remittance. When we send our Won to, for example, Philippines, most of us know that there is a corresponding remittance fee to that. But we don’t know that we are not only charged by just the remittance fee, on top of that, there are other extra charges deducted to our money, and when I say “Extra charges”, I mean “EXTRA CHARGES!!!!”. So, what are those charges? When you send money to a particular bank in the Philippines, you must select a bank to handle this process. Depending on the amount of won you’ll send, a particular bank will charge you a fee called “Handling Charge”. At least we all know about this. Sometimes we call this the remittance fee and of course we are willing to pay for this. It’s business after all and any bank will not provide the handling service without corresponding fee. Fees may vary for different banks, channels and amount of money. These are the three main factors that will determine the handling charge. Costs may start from as low as 2,500 KRW up to 25,000 KRW. However, it doesn’t end just like that. You don’t know that banks have this thing they called “Swift Charge”. The Swift charge is a payment for a service that allows banks to exchange messages including payment instructions . The cost may also vary from one bank to another from as low as 5,000 KRW up to 8,000 KRW. Just when you think the charging of fees chronicle is over, you are wrong. If you are sending money from a Korean bank to a bank in Philippines, there is this thing they called “Interbank Charge”. Again, cost is different for each bank, usually, from 10,000 KRW up to 18,000 KRW. Now, you do the MATH!!!... Add Handling Charge and the Swift Charge and the Interbank Charge, for an average remittance of maybe 1 Million KRW, total charges may start from at least 28,000 KRW up to maybe 36,000 KRW. I can’t give the exact number because fees are different for each bank in Korea. So, what are our options to minimize the remittance charges? Well, first and foremost, I have to clarify that I am not in any way connected to what I am going to endorse now. I don’t receive commission or whatsoever, this is just an opinion and the remittance options I know you can get the best deal. If there are options better than this, then probably I don’t have any knowledge about that, or lack thereof. Aside from their promise that their service is fast, convenient and they have competitive FX rates, KB-BPI remittance service has very low charges. This charge doesn’t only mean the handling charge, it also includes the swift charge and the interbank charge. Since we couldn’t get these termite charges out of the equation, the only way we can do to minimize the charges is to find a remittance service that offers the lowest charge, and compared to any major banks in Korea, the KB-BPI tandem is significantly lower. 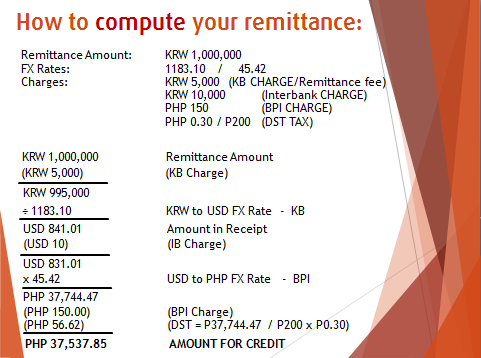 Let’s say for example, you are going to send 1,000,000 KRW to the Philippines, these are the charges involve at KB-BPI and how they compute it. Please take note that FX rate varies, this is just an example just to show the charges in your remittance and how it is computed. If you go to other banks, the computation is generally the same, except that the extra charges and the handling fee is higher than what KB-BPI can offer. If you have more questions about the KB-BPI remittance service, feel free to contact Roy Perez BPI on Facebook. He is the BPI representative here in Korea and I would like to thank him also for allowing me to disclose the computation in this blog. Woori Bank has been my remittance service provider since I came here in Korea. Although compared to KB-BPI, the regular rate of Woori bank when it comes to handling charges, swift charges and interbank charges is higher, I like how Woori bank has marketing promotion for the benefits of foreign workers in Korea. 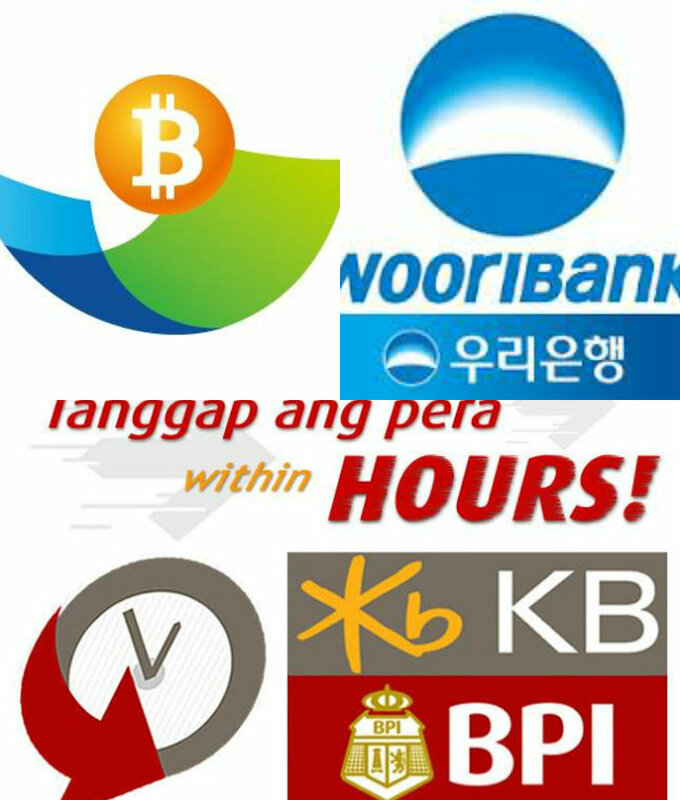 Woori Bank allows foreigners to send remittances to the Philippines through Moneygram and bank to bank transfer. When it comes to remittance fee, bank to bank has lower rate compared to moneygram, but most people still send via Woori-Moneygram because the recipient can get their money instantly. Bank-to-bank transfer has lower rate but it takes 2 to 3 days before the money will arrive in the Philippines. Although Woori bank has considerably higher rates when it comes to charges, they have this thing they called “Direct Overseas Remittance Service”. This is only applicable for bank to bank transaction. The benefits of this are, you can transfer money via ATM, you will get 30% discount on the remittance fee and 50% discount on exchange rate to USD, JPY and EUR and 30% discount on other currencies. That’s a big help to minimize the charges. If you want to know more about Woori Bank remittance, their Hyehwa branch is open every Sunday. Feel free to visit and inquire. A new blood when it comes to remittance service, Payphil is proud to present their new way of transferring money to the Philippines. They use Blockchain, a new technology of Bitcoin. But you know what’s great about Payphil? You can completely eliminate those charges I mentioned above. They only charge you an average of maybe 5,000 KRW for a 1 Million won remittance. They have delivery fee charge if you will send it through the pawnshop but very minimal. Bank transfer is completely free of charge. What is good about Payphil is that it is just a money transfer, so if you want to try out their service, you don’t need to go through the trouble of cancelling your account in other banks. And another thing, the FX rate of Payphil is based on the current actual exchange rate. It is changing from time to time. If there are other remittance service that can offer best deals aside from the ones I mentioned above, feel free to send me a message so we could add up to this list. For time being, I guess these are my Best 3 when it comes to sending money to the Philippines. It’s up to you to choose the best alternative to minimize your remittance charges. Protect your money by knowing the best option available for sending money. No doubt BluePan Payphil is the best remittance service provider for ofw here in korea. I have tried different kinds of remittance services from different banks which include woori(moneygram) and keb(easy one account) and based on my experience Bluepan is the the easiest, fastest , and most convinient way to remit money to the philippines.